Our planet popped into existence some 4.5 billion years ago. Life didn’t waste time, emerging shortly thereafter—but the exact timing of this momentous event is still unknown. A study published today offers new clues into this enduring scientific mystery by claiming to have discovered Earth’s oldest fossils in 3.5 billion-year-old Australian rock. Sounds like an important result, but other scientists are disputing the claim. Decades ago, UCLA scientist J. William Schopf collected samples of ancient rock in Western Australia’s Apex chert deposit. These rocks are fairly unique in that they’ve managed to avoid the ravages of time, appearing almost identically to the way they did some 3.5 billion years ago. Normally, rocks get twisted, contorted, and blasted with heat due to various geological processes, but not these rocks. Schopf completed his first analysis of these rocks in 1993, finding what appeared to be microfossils; some structures within exhibited a cylindrical, filamentous shape suggestive of life. More research was done on the samples in 2002, but skeptics remained unconvinced, saying the shapes were strange minerals that just happened to look like the fossilized remnants of biological specimens. 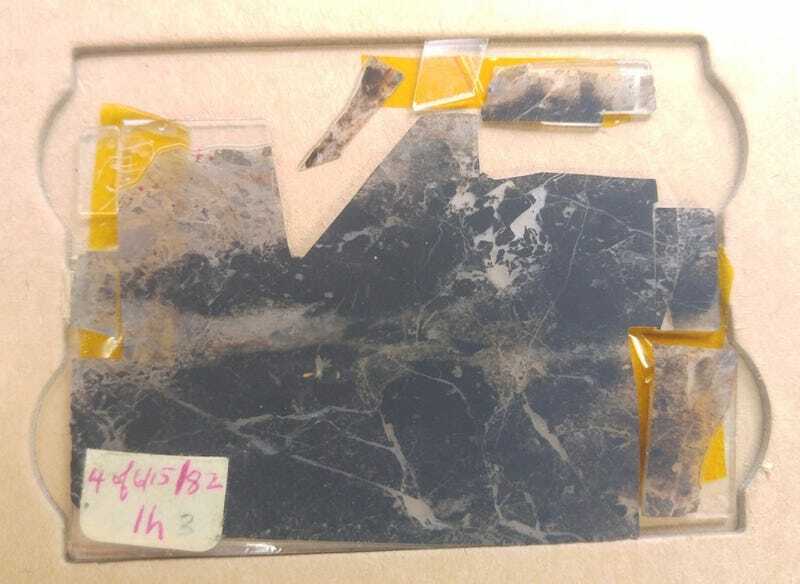 Now, in yet another analysis of these rocks, Schopf, along with colleagues from the University of Wisconsin-Madison, say they have definitive proof that these structures are the real deal, making them the oldest fossils ever found on Earth. These results were published today in the Proceedings of the National Academy of Sciences. The researchers are claiming to have found 11 different microbial specimens in the ancient Australian rock, linking their preserved physical structure to chemical signatures characteristic of life. These aren’t fossils of ancient fish, reptiles, or bugs, but rather primitive forms of microbial life, such as now-extinct bacteria and microbes from an early branch of life known as Archaea. Papineau said the samples appear to be composed of kerogen—complex fossilized organic material—that contains the elemental, molecular, and isotopic compositions of degraded and slightly cooked microbial life. The interpretation of these organisms as a mixture of methane- and oxygen-producing microbes is reasonable, says Papineau, but as for their status at the world’s oldest fossils—not so much. David Wacey, a scientist at the University of Western Australia’s Centre for Microscopy, Characterisation and Analysis, was less charitable in his assessment of the new PNAS paper examining the Australian rock. Wacey said the authors have ignored previous work “that has clearly shown that their favored Raman technique does not possess the spatial resolution to show the true distribution of the kerogenous carbon in these objects,” while at the same time failing to “cite the latest and most detailed paper that performed very high spatial resolution analysis of such objects”—a study in which Wacey, to be fair, is listed as lead author. [The] light microscope and Raman data presented here do not, in my opinion, demonstrate that these objects are microfossils, and the isotopic data are scarce and questionable. Even if the isotopic data do turn out to be technically robust, similar data could be produced by adsorption of multiple generations and/or sources of carbonaceous material onto mineral grains in a complex hydrothermal setting. Whether such adsorbed carbonaceous material is ultimately biogenic, non biogenic or a mixture of both is still open to debate, but these microscopic objects are not, in my opinion, microfossils. Wacey also said there was a “fundamental flaw” in the way the paper was handled by the editors of PNAS. Wacey, by the way, is an active participant in the hunt for the planet’s oldest fossils. In 2011, Wacey’s team discovered evidence of 3.4-billion-year-old single-cell organisms, also in Australian rock. That discovery was, at the time, the record for the planet’s oldest fossils. Clearly, this is an intense and lively area of scientific debate. The latest research published today adds to this scientific dialogue, but it’s clear this issue is far from being settled. I think David Wacey indeed has some issues with micro-Raman. The Raman data does indicate that the microfossils are composed of organic matter, and the new data does show isotope compositions consistent with life, including different microorganism. The previous results of Wacey are also consistent with a biological origin, something he does not acknowledge and which shows his bias towards a non-biological interpretation. I also have no quarrels with Wacey, but I do not think that his favored interpretation (which is that adopted by his PhD mentor, the late Prof. Martin Brasier) will not stand the test of time. As for the ‘multiple generations of organic matter’ comment, I would say that we have not yet begun to consider that this could be expected due to the non-equilibrium nature of organic chemistry in nature.